Watching TV is relaxing, but it also takes up a lot of time, especially if you're binge-watching the latest Netflix show. 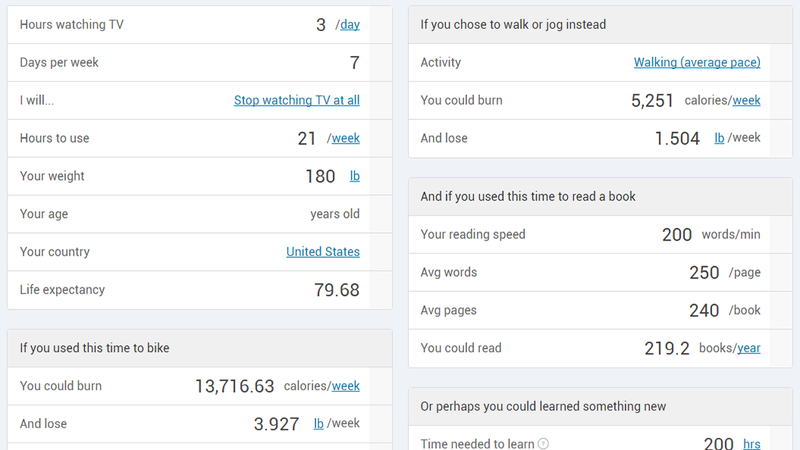 This tool helps you see how much you could be running, biking, reading or learning if you cut out TV. The tool, from specialty calculator site Omni Calculator, lets you enter how much time you spend watching TV every day. You then enter some basic information about yourself like age and weight (this data isn't stored or tied to an account), and then the calculator will show you several alternatives. For example, you can see how much weight you could lose by walking, jogging or biking every day for that same amount of time instead. You can also see how many books you could read. If you want to learn a new skill, enter how many hours you think it would take to learn and the tool will tell you how many weeks it would take to finish. We've featured a number of Omni Calculator's tools in the past and you can explore more on your own, but this one is unique enough to be worth singling out.